From singing cats and operatic ogres to magical creatures whose wings dazzle in a shimmering burst of light. From scared baby dragons taking their maiden flight to graceful dragons well-versed in the ancient art of storytelling. And then there are those who consider their home to be "curvy and swervy and (somewhat) topsy-turvy", while others believe that "straight lines guide you along a straight path". The ACE! Festival 2014 was an enjoyable experience for us. Reviewing the plays on behalf of local family portal Little Day Out, our little son Z got the opportunity to watch all five of the plays. And he enjoyed every single one of them! I Theatre, which produced three of the plays and brought in two UK-based productions, stated that the festival theme was "Long Ago and Far Away", and it promised to explore not only stories and music and performance, but also "experiences, environments, cultures, sights and sounds". And the festival delivered all these and more! Little Z taking a shot with the cast from "Puss in Boots". What was particularly strong about the plays was the characterisation. For instance, the Ogre Queen Arigula Funghi was particularly convincing in the play Puss in Boots. Her comments on morality were delivered in a crisp French accent, almost as if they were the voice of conscience spoken by the scriptwriter Brian Seward himself. 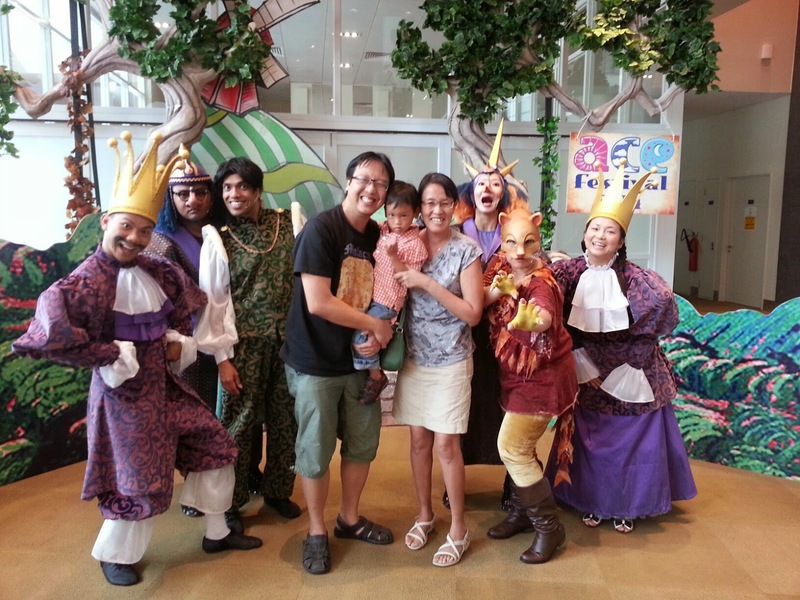 And in "Spot the Difference", children were overheard making comments even after the play that they preferred the bubbly and vivacious character of Soo more than that of straight-laced Vik. Fervyn Tan's Soo had apparently stolen the hearts of the audience by her convincingly charming performance. The background sets and costumes were also delightful and enthralling. For instance, one would be swept into the ethereal world of the Starbird almost immediately. The textured feel of the props, and the outlandishly opulent costumes dazzled all in the audience, children and parents alike. As for Dotty the Dragon, the charming village scenescape, with its jigsaw-like feel and lovely puppetry, instantly drew the audience to believe it had been invited for tea in an English country village. Z's special moment with Andrew Alan Kent from the cast of "Dotty the Dragon". Music and dance were key components in the ACE! Festival. Under the Dragon Moon was hypnotically charming in how different dance traditions were amalgamated into one stunning performance. We particularly enjoyed how colour and movement were of immense significance in the dances, and how these conveyed the symbolism and emotional imagery of the stories. As for "Puss in Boots", master songwriter and composer Bang Wenfu infused a whole array of musical genres into the songs. We particularly enjoyed his re-make of the Katy Perry number "Roar", and that tune is still humming in my head today. But the raison d'etre for all good productions is the storytelling itself. Mara Menzies spun a hypnotic tale as the Storyteller in Starbird. 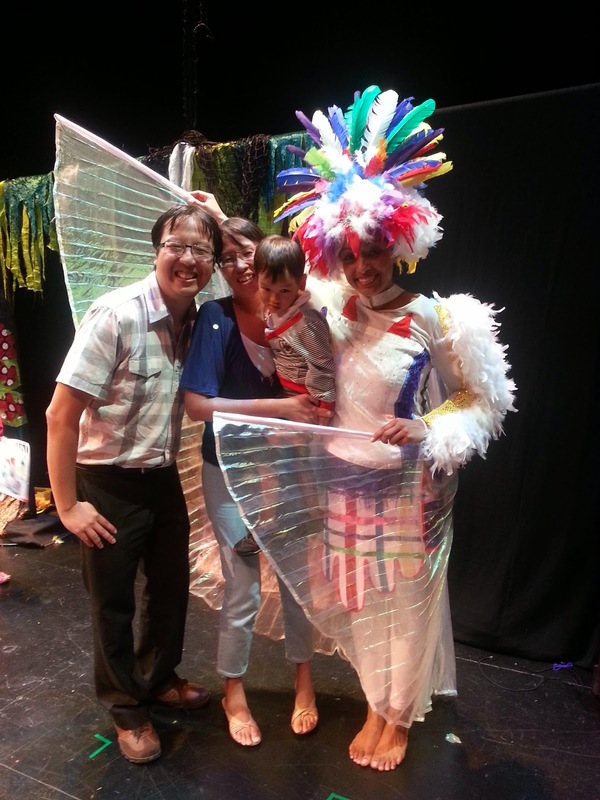 The production was high in audience engagement and very quickly drew in the children to participate in the numerous adventures experienced by the Starchicks. 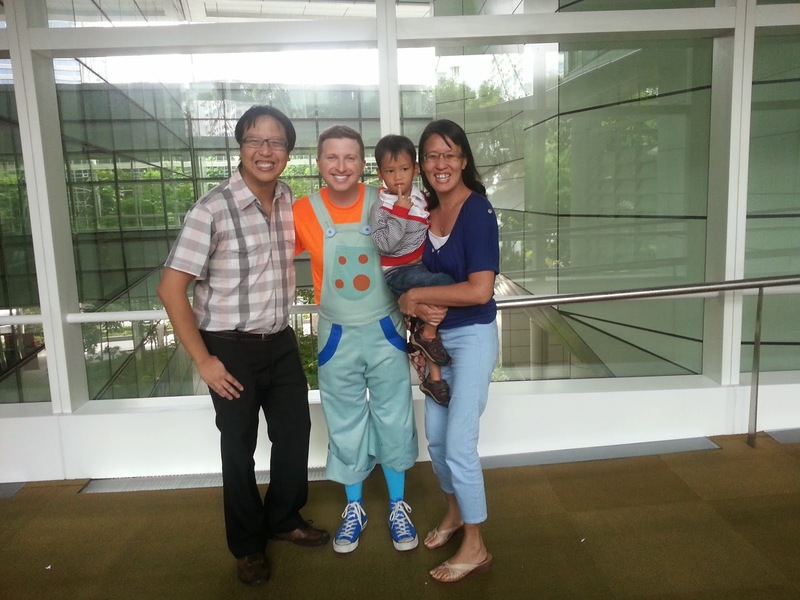 Likewise, the three-men cast of Simon James Sanchez, Chris Yesdi Jefferies and Andrew Alan Kent were enthralling in their telling of the story Dotty the Dragon. You could almost hear feel the helplessness of the Night Watchman as he shared how he was supposed to be the village's guard, but yet without the ability to defend the village should a fierce dragon invade. And the washerwoman's plight was almost sad as it was humerous. As for Under the Dragon Moon, its ensemble of storytellers (also known as Jewels) performed magnificently in their rendition of the five Asian tales. The stories were indeed funny, happy and sad; and the seamless transition from one story to the next often left the audience hungry for more, even as one story ended and another began. The lovely Starbird displays her dazzling wings. As parents, perhaps the greatest impact that ACE! Festival 2014 has had on our son is that it has made him a fan of the theatre. We are sometimes amazed that we can discuss the merits of different performances with him even though he will only be turning 4 in July. Our little boy has also learnt the art of creating stories. This morning for instance, he was so eager to tell his Daddy the story of an "Egg in the Jungle". Daddy asked if the story was like that of the Starbird. To that the little boy answered to the contrary, and proceeded to tell his own version of the "Egg in the Jungle", a story that sounded suspiciously similar yet refreshingly different. Perhaps little Z will one day be his own storyteller, and create the magic that dreams are made up of! This is the fifth year that the ACE! Festival has been brought in by local theatre house I Theatre. The 2014 season features five excellent plays. You can read more on the ACE! Festival 2014 website here. The Actor-Character Dynamic - Learning from Spot the Difference Director Isabella Chiam how actors develop their character for the stage. Music from the Heart - Listening to the music of Puss in Boots and learning from master composer Bang Wenfu how to make a musical sing.